The view from the Boat House: where the Sakonnet River meets Mt Hope Bay. The hill across the waters i Mt. Hope, Bristol. 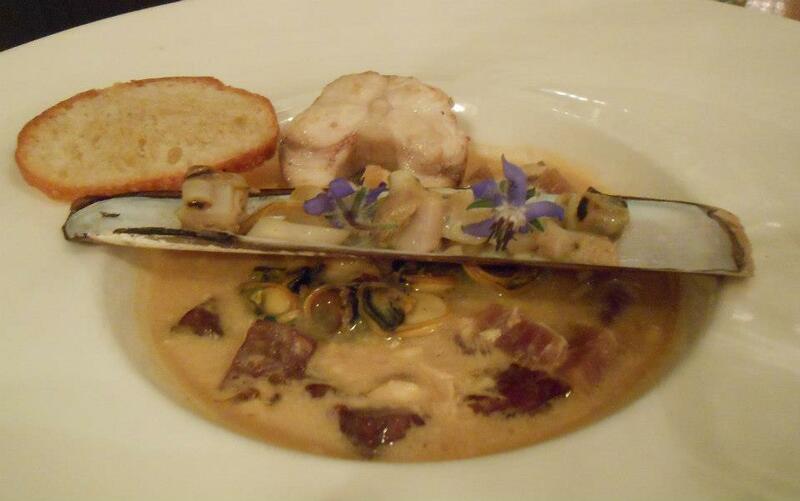 Chefs puzzle over how to remove periwinkle meats from their shells. Chef Jonathan Cambra shows his team how to extract periwinkle meats. 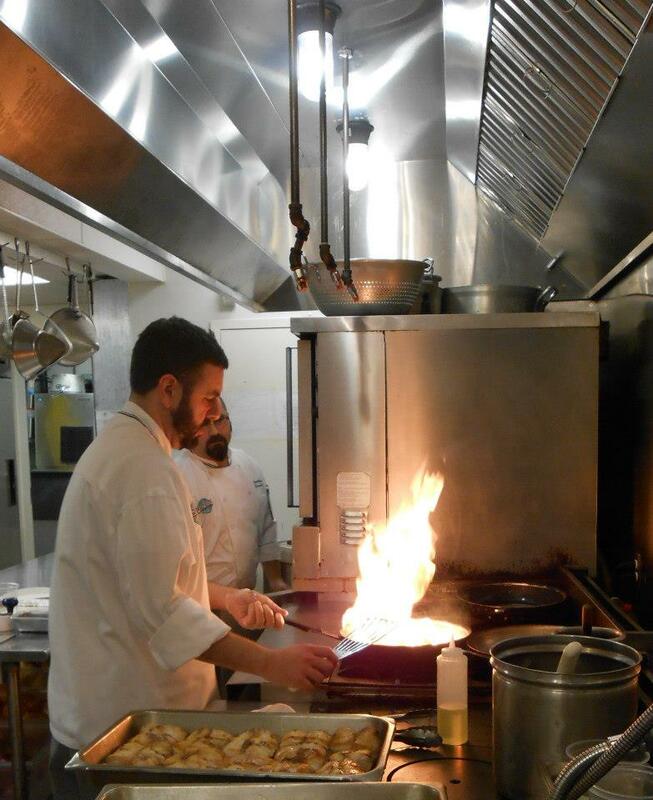 Sous chef Max Peterson cooks monkfish. Making hot sauce for the raw bar. 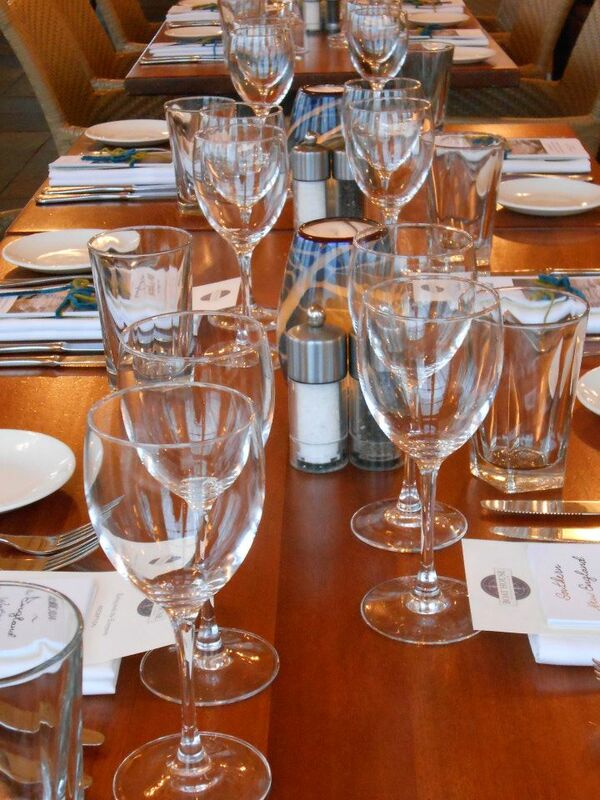 The place settings glimmer in the setting sun. The evenings educational offering: packet of information on species biology, speakers, and the Southern New England waters ecosystem. 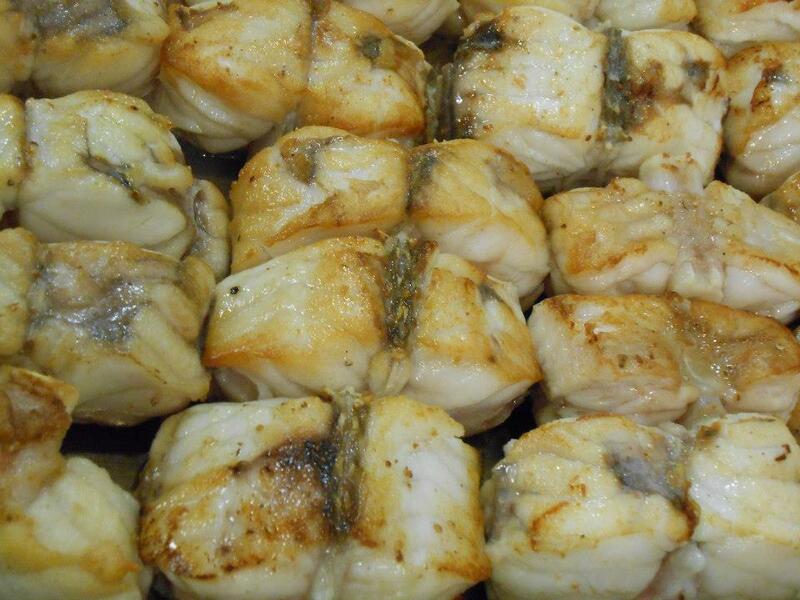 Monkfish undergoing preparation in the kitchen. 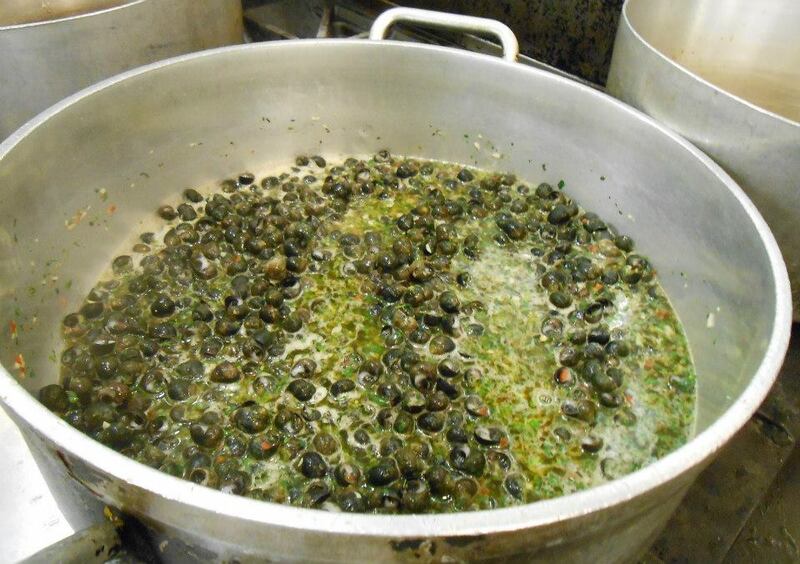 Periwinkles simmering in an herb sauce. Chefs prepare the raw bar. 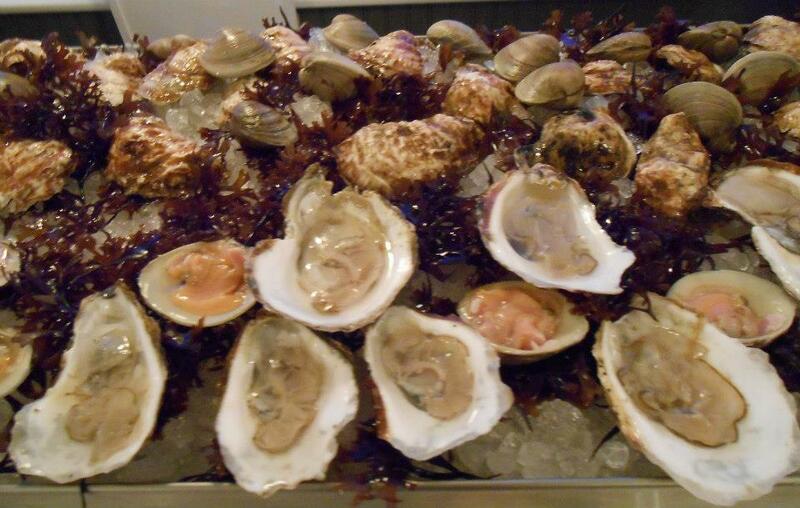 Raw bar: Wild oysters harvested by Billy Silvia of Bristol, RI; littlenecks, and Irish moss (red seaweed). 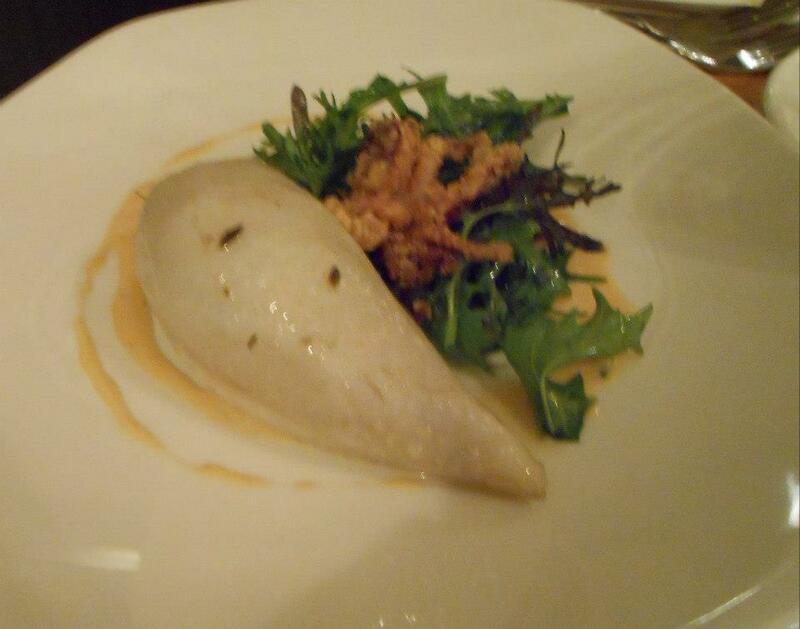 Guests enjoy the first course, a squid dish. The evening's speakers get to know one another: Jeremy Collie, fisheries ecologist at the University of Rhode Island, and Billy Silvia, commercial quahogger and charter boat captain from Bristol, RI. Guests listen to Billy Silvia, commercial fisherman from Bristol, RI, as he explains the changes he's seen in fish populations in Narragansett Bay. 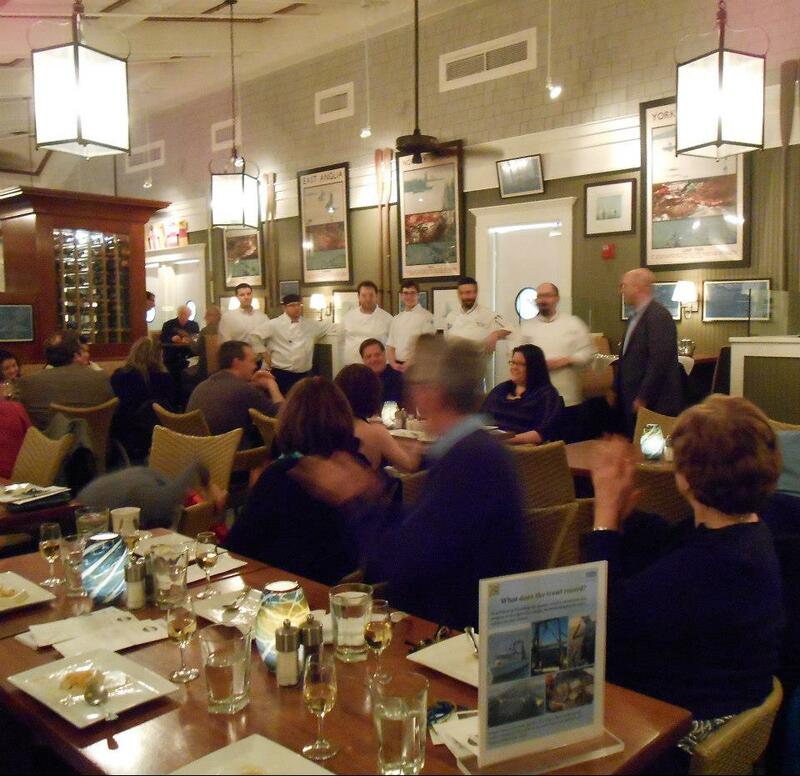 The team of chefs who prepared the dinner comes out to discuss the culinary elements that went into the experience. 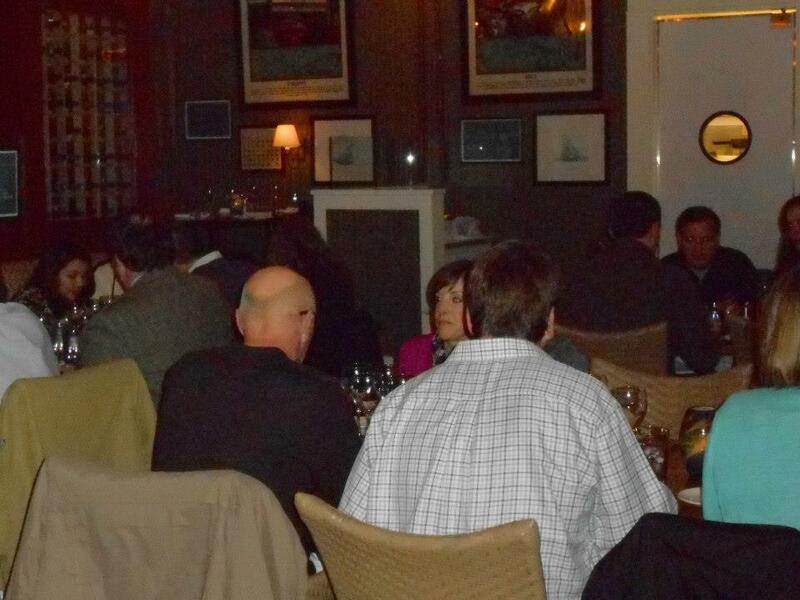 Fifty guests gathered in the gorgeous dining room of The Boat House Restaurant, overlooking the Sakonnet River. 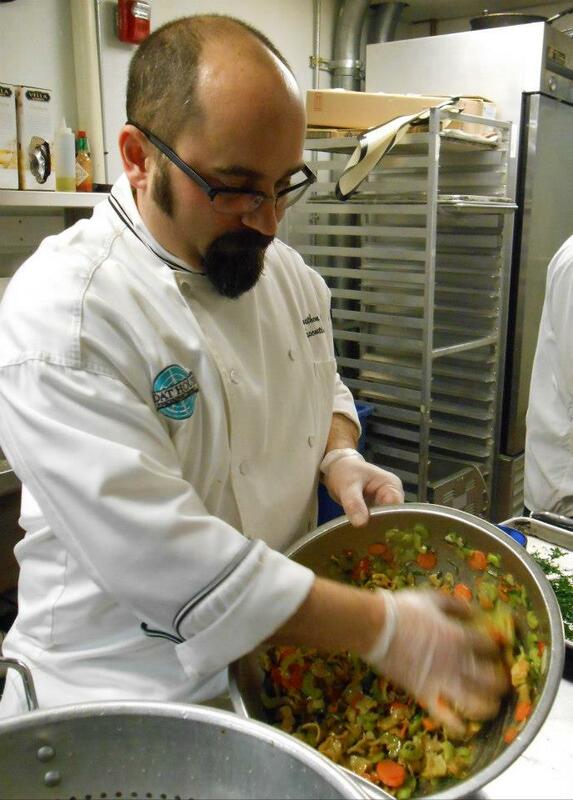 Chef Jon Cambra and his team prepared an astounding variety of Southern New England sea life for the delectation of the guests, including some lesser-known, hyper-local species like periwinkles and slipper limpets, collected just up the Bay in Bristol. The chefs' dessert presentation further demonstrated their culinary prowess and commitment to using local foodstuffs in creative ways: it was a blanc-mange (similar to a panna cotta) that was gelled using Irish moss seaweed collected on the rocky shores of Newport! 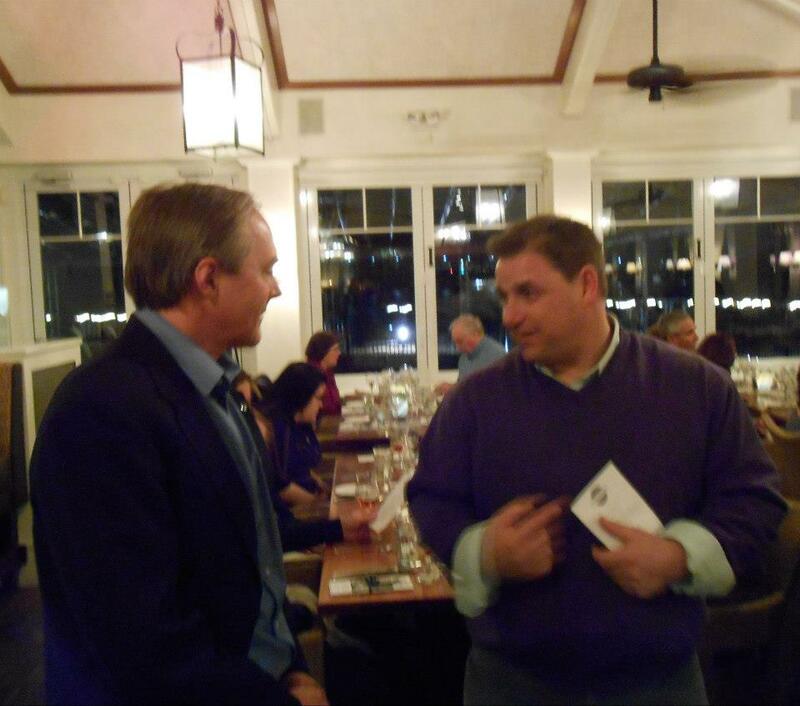 Guest speakers Jeremy Collie (URI oceanographer) and Billy Silvia (Bristol fisherman) narrated the dinner, detailing the changes that they have each observed in the kinds of fish that are present in Narragansett Bay. Area Management Plan Habitat Advisory Board, the International Council for the Exploration of the Sea Working Group on Ecosystem Effects of Fishing Activities, and the National Research Council Committee on Evaluating the Effectiveness of Stock Rebuilding Plans. Captain Billy Silvia has been fishing since he was "knee-high to a littleneck". 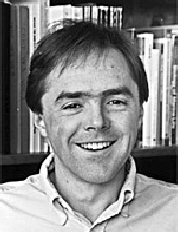 A lifelong resident of Bristol, he started his career at a young age by catching winter flounder off the dock and helping on his dad's quahog boat. From there, he became a full-time Narragansett Bay shellfishermen for awhile, before launching a side career as a commercial rod-and-reel fisherman chasing bluefin tuna. On one of those adventures, he caught the largest mako shark on record, a 1,324-pounder. More recently, he added charter boat captain to his resume. His quahog skiff is the Sweet Melissa and his charter boat is the 28-foot Can't Imagine. 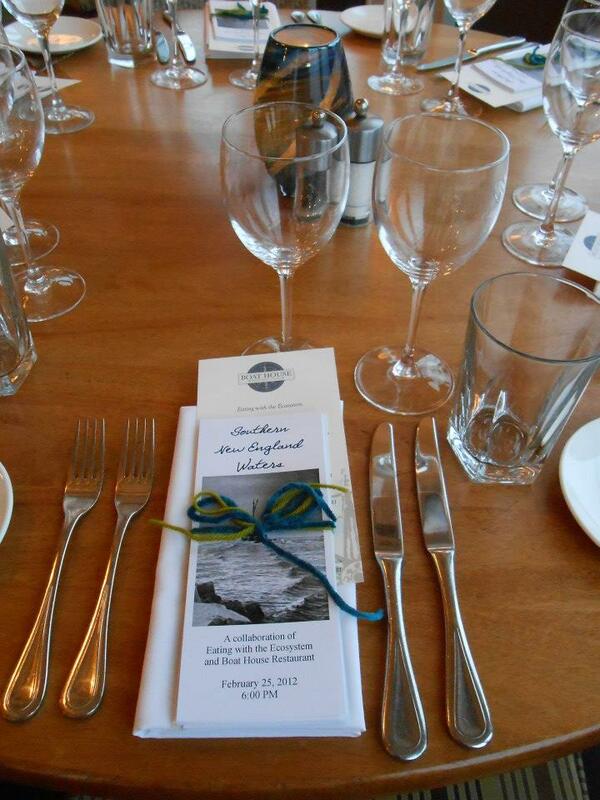 The Boat House is located at 227 Schooner Dr Tiverton, RI 02878.